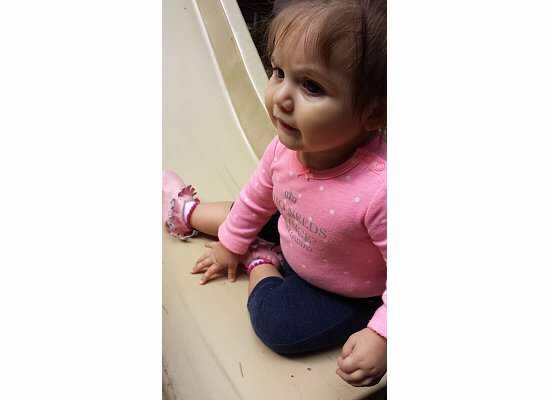 - She pulls herself up on objects like the sofa or people and she is starting to walk will holding on to objects. - She has figured out how to rock back and forth on her knees. Pretty soon she will be a speedy little crawler. - Her favorite toy to play with right now is a mini version of Belt from The Croods. She is really into playing with her brothers things. - She has six teeth (four on top and two on the bottom)! - She is very smiley, except for when I try and take her picture. - She loves the sound of her own voice. She is a little babbler and she even sings. - When she sits on the floor, she kicks her feet nonstop. I can tell she's going to be hyperactive when she's older. - Rora finally eats a jar of baby food at each sitting. She loves her fruits and sweet potatoes. - She enjoys following mom around the house. - She loves playing the drop game. She thinks its hilarious. - Her chubby little thighs are starting to go away now that she is learning to stand and walk around objects. Every day she gets one step closer to walking and I don't like it. - Her hair is coming in blond. She's my little Goldie Locks. - She also is obsessed with the vacuum. She will chase it around the house while we clean. She also loves to turn it on for me. - Clickers and phones make great teething toys in her mind. - She also likes to rock herself back-and-forth against the wall. She likes it, even when she bumps her head against it on accident. - She plays peak-a-boo with pretty much anyone. - She is a major flirt too. - She loves sucking on her toes. - She can say mama, dada, ba-ba, and nom-nom's. She also says her name. - Rora is also is learning to feed herself. She tried olives the other day and was kind of grossed out by them. She loves banana's (I swear all babies do!). I can't seem to think of anything else at the moment but will add it to next months update. I still cannot believe how fast the past year has gone. My sweet Aurora will be a big girl soon but I am going to try and enjoy the last two months of her babyness before she becomes a full fledged toddler. Happy 10 months Princess! We love you baby girl.